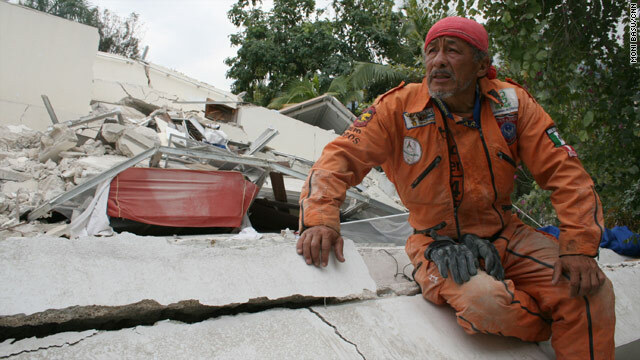 Hector Mendez, 46, travels from Mexico to help search for survivors of disasters around the world, including Haiti. Port-au-Prince, Haiti (CNN) -- A sweet sadness blankets Hector Mendez's face, appropriate, perhaps, for a middle-age man who has seen suffering and miracles at once. Many other rescuers have left the Haitian capital, no hope left in their hearts 15 long days after the massive earthquake that ravaged this country and entombed so many in the rubble. Every day for more than a week, he has stepped down into the dark crevices of a destroyed building to look for two people: Daniel Varese and his 4-year-old son Mateo. Mateo's mother, Marylinda Gonzalez Davi, a United Nations employee from Guatemala who has been living in Haiti for four years, was at work when the earth shook violently on January 12. Rescuers pulled her 1-year-old daughter Fabiana alive from the rubble, but there was no sign of her husband and son. She refused to believe they were dead. Word of her plight reached Mendez, who had arrived in Port-au-Prince with a team of 25 Mexican rescue workers. "We told her we won't leave. We will stay by her side," Mendez said. He has a grandchild the same age as Mateo. His orange jumpsuit dulled by dust, Mendez and his crew made camp adjacent to the rubble of the landmark Hotel Montana. They slept out in the open, with Gonzalez and her friend. They took short naps to re-energize. Then they went back in to search. Each day, they pulled things from the place that Gonzalez called home: a stuffed animal, her husband's computer, a piece of carpet. It helped Mendez to know what room of the apartment they had entered. He kept moving, deeper and deeper. In search of smell. In search of the slightest sound. Of an infant's whimper, a man's weak cry for help. Mendez became convinced father and son might be alive. He knows well the science of rescue after doing it for a quarter century. "There is no smell," he said. And that could mean they were alive. Even two weeks after the earth shook, people were being rescued. Each gave Gonzalez hope. And that propelled Mendez. He believes in the power of love. The strong bonds between a man and his child, trapped together. That link, he thought, could be enough to sustain them. After a killer earthquake struck his hometown of Mexico City in 1985, Mendez, 46, felt a need to give back the humanitarian gestures extended to his own people. He joined a team called the Topos, or moles, named so because the rescuers wriggled through the deepest darkest corners in search of life. He volunteered to rush to disasters: to Indonesian quakes, five times; to Latin American countries; to Iran, Turkey, India and Egypt; to New Orleans, Louisiana, after Hurricane Katrina and to New York after the 2001 terror attacks. Haiti, he said, is one of the worst situations he has seen. "People are very, very poor here." Much of the infrastructure and construction was so shoddy. This was the first time government officials paid for his flight. Usually, he finds his own way. And that has left him penniless and jobless. "Who will hire this old man now?" he asked. "People tell me I am mad." He does the work because he loves to help people. "It's worth it to find one person alive." Behind him, the incessant sound of a jackhammer deafened the ear. Above him, the roar of jets taking off from the airport. But it was below where Mendez belonged. Sometimes, in the darkness, when he was crawling like a mole, the earth trembled. "Replica! Replica!" some of his men shouted. There was always the fear that whatever was left standing would tumble in the many aftershocks this city has felt. "We laugh," he said. "We don't scream like ladies. There is nothing you can do inside. You only die once. It would be an honor to die in the rubble." From other people, the statement might seem trite. But Mendez's eyes make you believe. He is called Chino because people say he looks Chinese. He says he has the look of a fierce Mexican Indian. After so many days, Mendez was running on two hours sleep -- and hope. But late Wednesday his search finally ended. His men found two bodies buried deep in the apartment. Mateo was in his father's arms. In Haiti, Mendez had hoped for a miracle. Instead, he saw more suffering. This, too, will define the curves of his face.